Thanks to its central location, lunch in Beverly Hills seems like a good idea, but there're so many downsides -- from dropping big money, to finding decent parking, to -- seriously Brandon, can you stop inviting Andrea Zuckerman everywhere? She's thirty five! 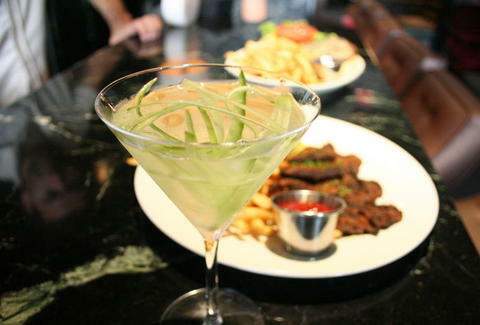 Making lunch in BH a much better idea, The Bar Room's 3-Martini Lunch. Just now available at the swanky, leather-strewn Bar Room, the 3-Martini Lunch is the classically boozy multi-course meal, now available as an off-the-menu special for just $50, which usually would cover just the drinks, otherwise the exclusive purview of tiny umbrellas. Food's a 3-course prix-fixe, w/ an entree including your choice of a charred bistro burger w/ jalapeno jack on Rockenwagner brioche, a turkey burger w/ homemade BBQ sauce, or a spicy skirt steak (all w/ fries); and an appetizer consisting of either the soup du jour or the house salad; and a dessert of three house-made cookies -- chocolate, ginger snap, and oatmeal -- just cause you drink like a man, doesn't mean you can't snack like a girl. As far as drinks, you get your choice of three of any of their specialty martinis/cocktails (ranging from a no-frills Blue Angel vodka martini to a Hendrick's cucumber number to a fruitier muddled blackberry option) or craft draught beers, which rotate but right now include Napa Smith amber, Affligem Blond, and Allagash White, which's served with an orange wedge, or an Eric Wedge if you're in Cleveland. In case you can't finish it all in one sitting/want to remain coherent, they'll issue a voucher on any drinks un-drunk good for a future visit, assuming you don't bring you know who. Oh crap, she sees us!